Marjorie Savage (left) and Jodi Dworkin have collaborated to launch a research-informed website providing valuable information to families of college students. 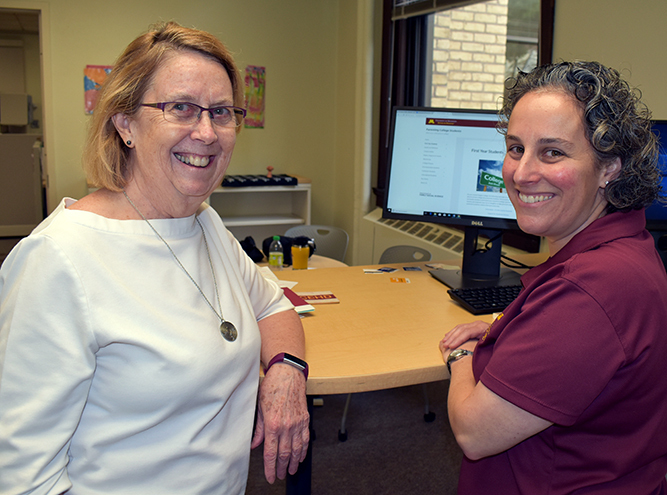 Jodi Dworkin, head of the Department of Family Social Science, in collaboration with Marjorie Savage, FSoS Education Specialist, today announced the launch of a new research-informed website, Parenting College Students: When your child goes to college. The website is a collaborative effort by faculty, staff, and graduate students and is a partnership between University of Minnesota Extension and the Department of Family Social Science. The website provides information about the issues faced most often by college students and their families and provides tips for parents and families so they can support their student’s success. “When parents and family members understand the college experience, they can better support their students,” says Dworkin. “While some colleges and universities now provide resources and hold events to support parents of their students, there are still many families’ questions and concerns that are not addressed,” says Savage. Content for the site is informed by academic research and includes new information about the student experience based on interviews and research with current students and parents. The site also helps parents and families navigate the University with key terms used in academic settings. Jodi Dworkin joined the University of Minnesota faculty in 2002 and is a professor and extension specialist. Her research focuses on risk-taking among adolescents and college students, promoting positive family development, parenting adolescents and college students, and the role of technology in these relationships as well as developing research-based outreach services to promote positive family development. A retired parent program director at UMN, Marjorie Savage is also the author of You’re on Your Own (But I’m Here If You Need Me): Mentoring your child during the college years.